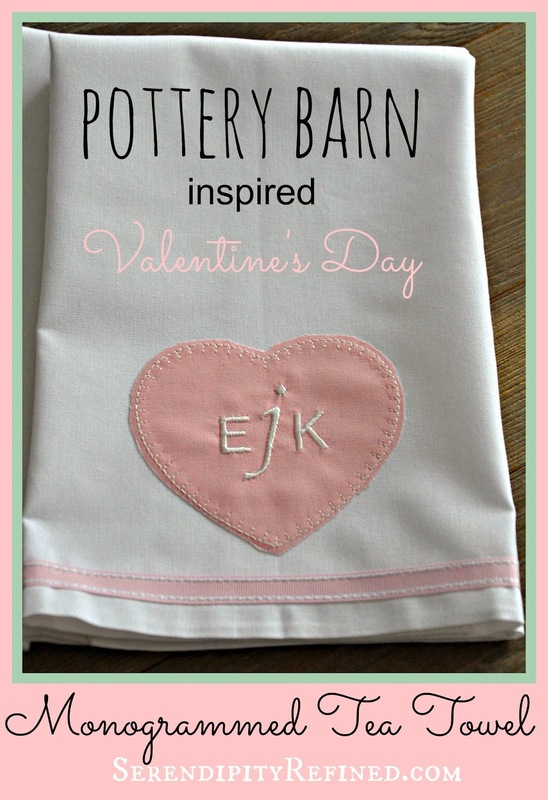 I used two cotton napkins (towels), a little pink cotton fabric, and some ribbon that I got at the craft store last year. 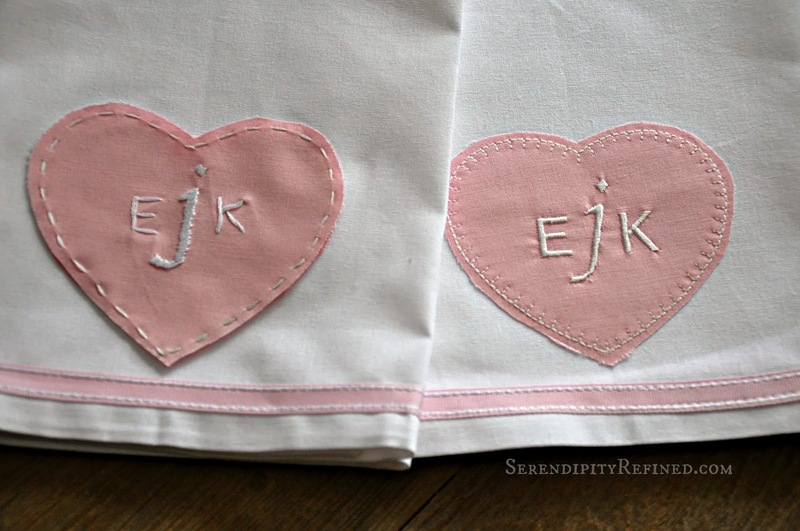 The first two that I made were embroidered with my sewing machine. They were finished so quickly and easily that I decided to make a table runner for the kitchen, too! For the table runner, I used some muslin that I had leftover from lining the plaid flannel Christmas stockings that I made for my "Let it Snow" ski lodge Christmas mantel which I folded in half and stitched to form the runner. 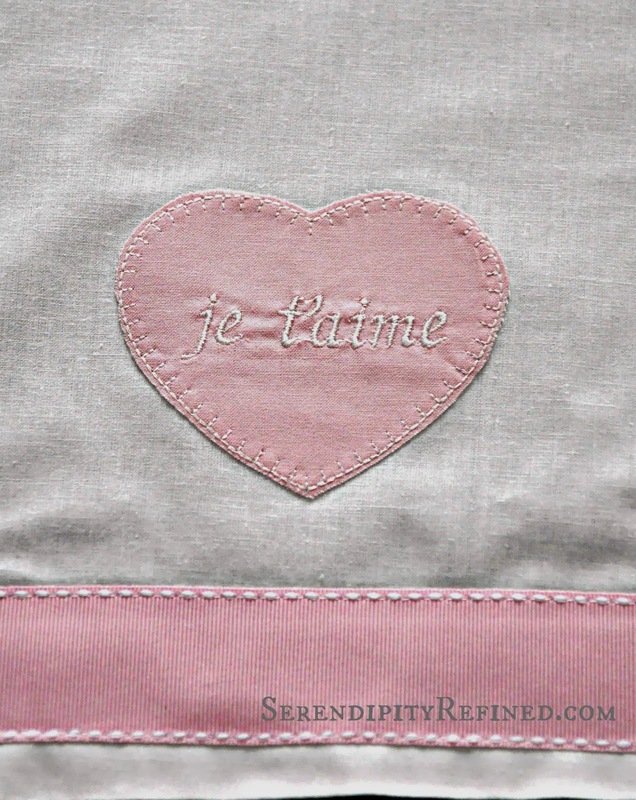 I created iron-on heart applique's with the French words for "I love you" which were placed about three and a half inches from each end of the runner . I used a wider version of the same ribbon that is on the towels for the bands on the runner. Stitch 1/4 inch ribbon trim about 3/4 inch from one end of the towel. 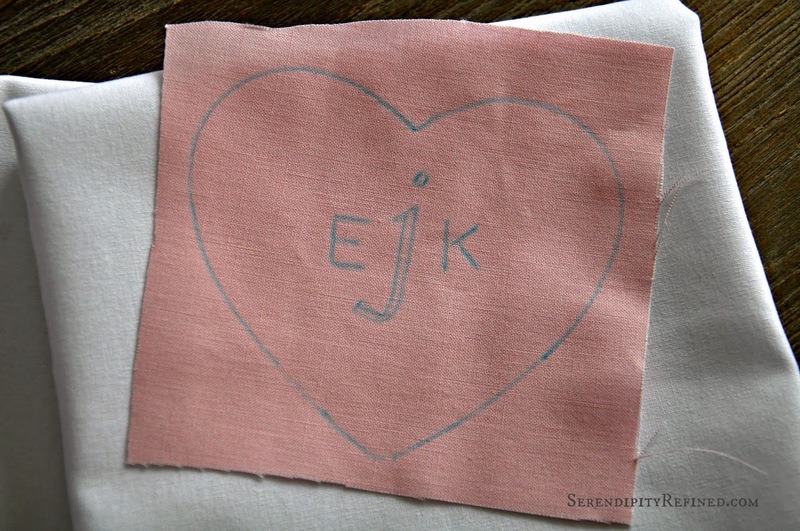 To make the hearts: Trace around a heart shaped cookie cutter or draw a heart free hand. 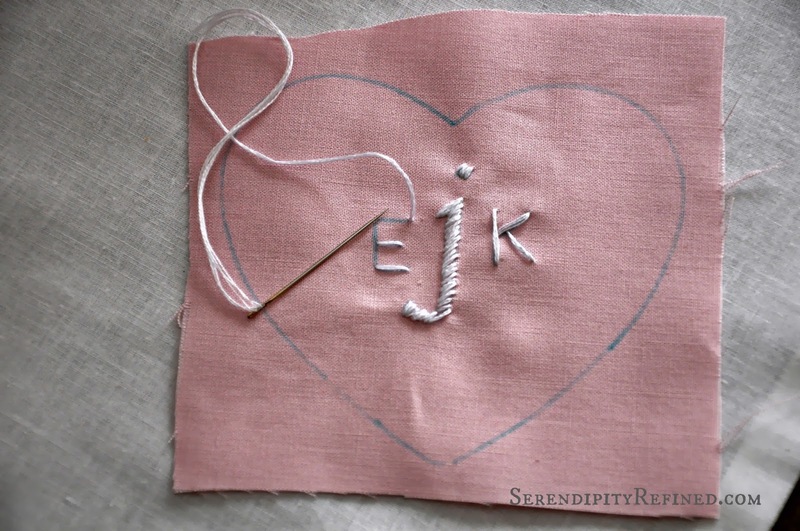 Embroider a monogram in the center of the heart and make a running stitch or blanket stitch around the outside edge. (The first two that I made were machine embroidered). Cut the hearts near the stitching leaving about 1/16th of an inch around the edge so that the hearts will eventually fray like the one in the PB photo. After the embroidery is complete, cut a piece of fusible interfacing to fit and iron it onto the wrong side of the heart. 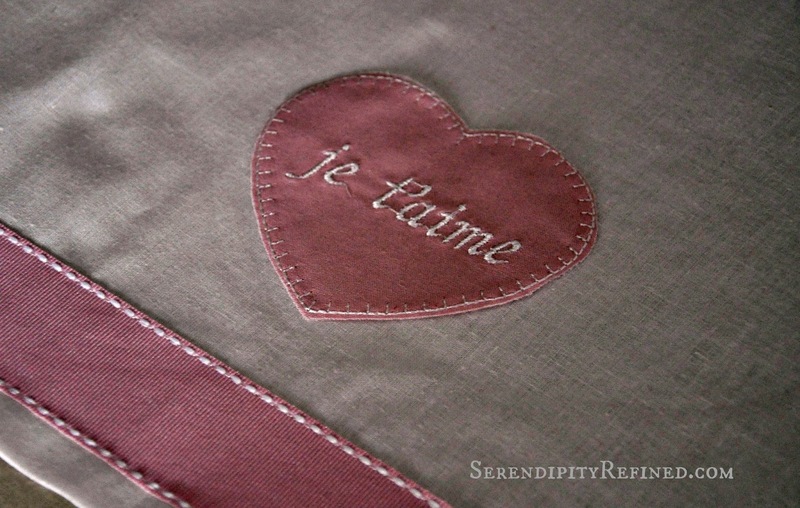 When the applique is cool, remove the paper backing from the interfacing and iron it onto the towel. Seriously simple. I mean it. 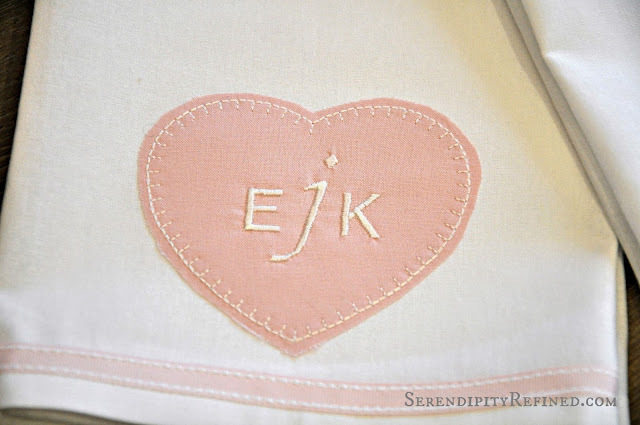 At this point, I realize that you're probably sitting at your computer thinking to yourself, "Sure, they're easy... if you have a sewing machine that does embroidery." I also realize that it really isn't fair of me to call these easy unless they can be made in under an hour, by hand. So that's what I did. Sunday morning, before breakfast, I got out my water soluble fabric marker and traced around a heart shaped cookie cutter. Then, I sketched the monogram. I used 3 strands of white cotton embroidery floss. The stitching isn't fancy. This is mainly because I don't know how to do anything fancy but it's also because I wanted this to be quick. Heck, I didn't even use an embroidery hoop. 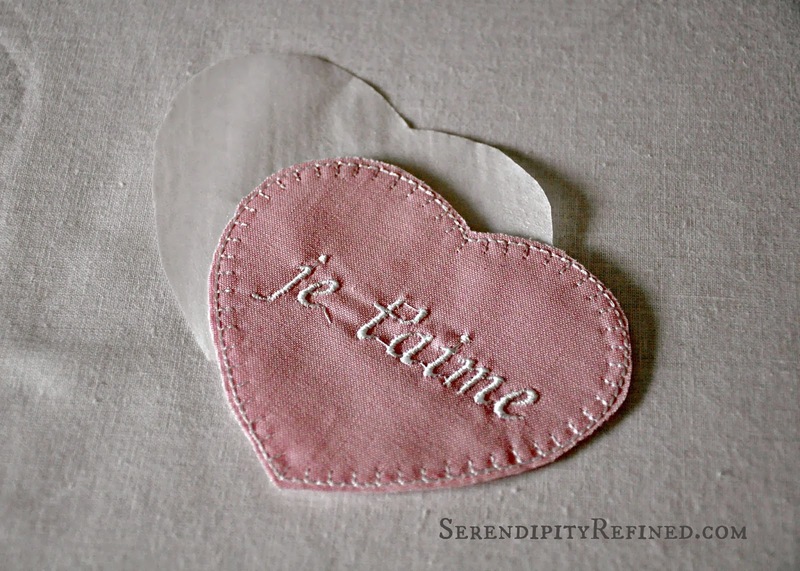 It took about 20 minutes to embroider and applique one heart. After the embroidery is complete, the steps are the same: Cut, iron on fusible interfacing and iron the shape into the towel. I suppose that you could actually skip the interfacing and do the running stitch around the edge of the heart directly onto the towel to hold the heart in place but I like the stiffness that the interfacing adds to the shape. Here are the two, side by side. I actually like the hand-embroidered quality of the monogrammed heart towel a little better than the machine embroidered one. It feels much more personal. 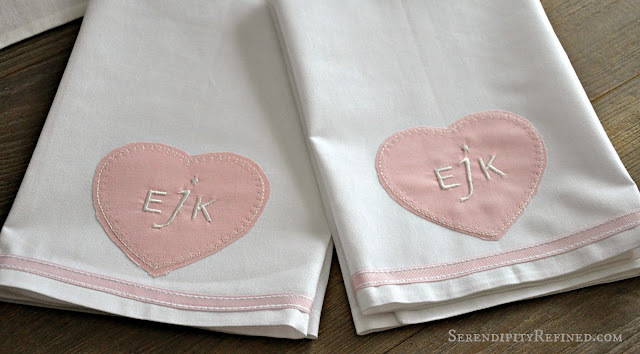 Either way, I still LOVE my French-y table runner and the fact that I didn't have to spend a cent to create new linens for my kitchen for Valentine's day! 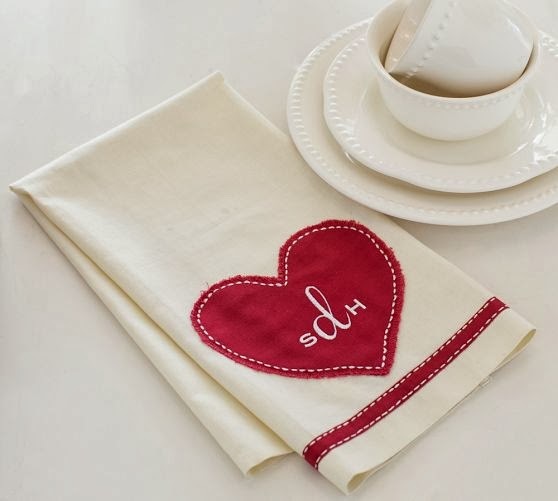 Now that I've got Valentine's Day monogrammed tea towels and a table runner, could a Valentine's day tablescape using things that I have on hand be far behind?! If you said "probably not", you're correct. Stay tuned.